← Nearly lost the exhaust! Late models of the B have a strange issue with a diode in the handbrake warning light circuit. When this diode fails you have the baffling occurence of the engine starting on the key in the battery position. The first time this happened we hadn't realised until we tried turning the engine off and it kept on going with the key sat in my hand! A scramble for the battery terminals followed. There appeared to be 3 options to perform a longer-term fix. All these involve removing this short-circuit without replacing the diode as in this model all it does is light the warning lamp, which I can easily do without. First off was to simply remove the diode. This sounds easy until you find out that the diode is hidden somewhere under the dashboard on the driver's side. After several attempts to find it while upside down, head next to the pedals looking up at the bundles of tape-covered wiring I gave up on this - it was nowhere to be seen. Next option was to cut the wire leading to the diode, but the radio was clamping the bundle of wires behind the console, making it impossible to get enough slack to cut a wire (and, more importantly, to put it back together if I cut the wrong one!). So after a bit of head scratching we removed the radio, intending to give access to the wiring, but realised this would now enable us to remove the bulb from the warning light instead - the manual instructs removal of the arm-rest and whole centre console in order to change the bulb, so this had been our last option, but now we could accomplish it much easier. The warning light bulb is removed by pulling the bulb holder (fig 2 shows the view through the radio opening, the holder can be seen next to the radio aerial) out from behind the console; it's a bit tight behind there but you can just about get enough leverage and fingers in to do it. The bulb has bayonet fittings. With the bulb out we tried the handbrake test and everything seemed fine until we turned the key fully and the engine started - along with the constant sound of the starter motor running in the background. So, removing the bulb had seemingly just moved the problem along. Again, I don't understand it, but that's what happened. Replacing the bulb put us back to the initial problem. 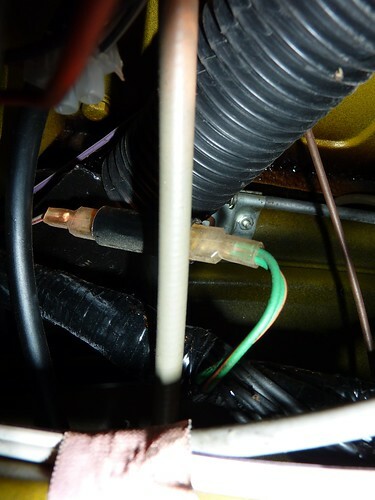 At this point I decided to have another look under the dash and almost immediately spotted the diode (fig 3 shows its location, you can see the diode illuminated by the torch; fig 1 shows the diode itself). It had two green and brown wires on one side of a black rubber tube and a red and white wire on the other. Tucked away almost above the steering column, I was able to just get one hand to it and disconnected one of the spade connectors. This seems to have done the job - we went through the testing procedure again and everything worked as it should - the warning light even came on with the handbrake which it hadn't been doing before.